Pretty and feminine, this Elady clutch from Dune is perfect for completing your new season look. 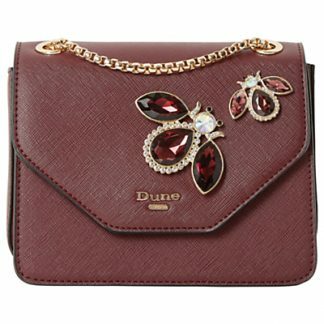 Featuring a flapover design with eye catching jewel embellishment, Dune branded hardware and a snap closure. The piece is finished with an inner zipped pocket and chain shoulder strap for hands free wear. Team with a flared dress and heels for a chic ensemble.